Our world is changing and changeable. Do you know where your organization is headed? Can you justify why you should go there? And provide the criteria for judging your progress and success? This pocket guide helps you through the process of creating a better future by giving you the principles and tools of mega thinking and planning. 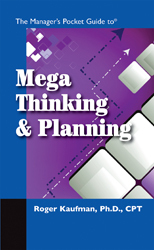 A Manager’s Pocket Guide to Mega Thinking and Planning presents an approach different from conventional approaches to planning. It focuses on the shared society in which we all live and to which we must contribute. It emphasizes ends, results and consequences throughout. And it addresses three levels of results: Societal, organizational and individual. This breakthrough approach not only works, but has been successfully applied almost around the world. You can confidently follow it to do strategic thinking and planning for every area of your organization – from manufacturing and human resources to shipping and marketing, and beyond. The practical and proven tools for successful strategic thinking and planning you’ll learn will help you identify opportunities and problems, justify what to change and what to continue in your organization and define and deliver success and prove your value.